Over the decades Mazda has produced some fantastic sports cars that enthusiasts have gone crazy for. These involving, lightweight, and often quirky cars are now weaved into car culture. Arguably its most fabled model is the rotary-engined RX-7, one of which stars in the latest Petrolicious film. However, it’s not just any RX-7, but one of the rare Japan-only Spirit R models. Aaron Backx is the owner of this rare model and. in this video, tells his story of falling in love with the RX-7. His passion begins with an auto-technology course he took at high school, which was based around Mazda’s latest sports car at the time, the RX-8. Just like the RX-7, the RX-8 features a wankel rotary engine that reduces weight and revs far higher than a typical motor with pistons. 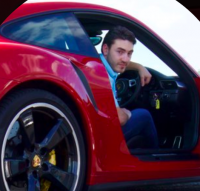 Living in Canada, Aaron points out that he didn't get much exposure to Japanese car culture, but his passion for Mazda and its cars grew to the point where he went in search of his own RX-8. In doing so he ended up test driving the car’s predecessor and, after that brief drive, was spellbound by the older car. Having saved up for a couple of years, he found his perfect RX-7, a JDM import Spirit R.
Aaron was after a stock Spirit R in black, no easy thing to find. The Spirit R cars served as a final 276hp farewell to the RX-7 and made up the final 1500 cars produced. The limited run cars were divided into Type A, B, and C with ‘A’ cars being the most performance focused. These Type A models are the most collectable and rarely stay on the market for very long. It’s also difficult to import Japanese cars to the US due to the distance and language barriers involved, and that’s before jumping through the required hoops to get the car registered. The Mazda RX-7 might be a high-maintenance machine to drive daily, but its agility and high-revving nature on challenging roads makes it a unique drive. Aaron reckons the car is so perfect that he has no need to modify it. Despite his example’s collector car value, he proudly drives it regularly. Aaron is our kind of guy!